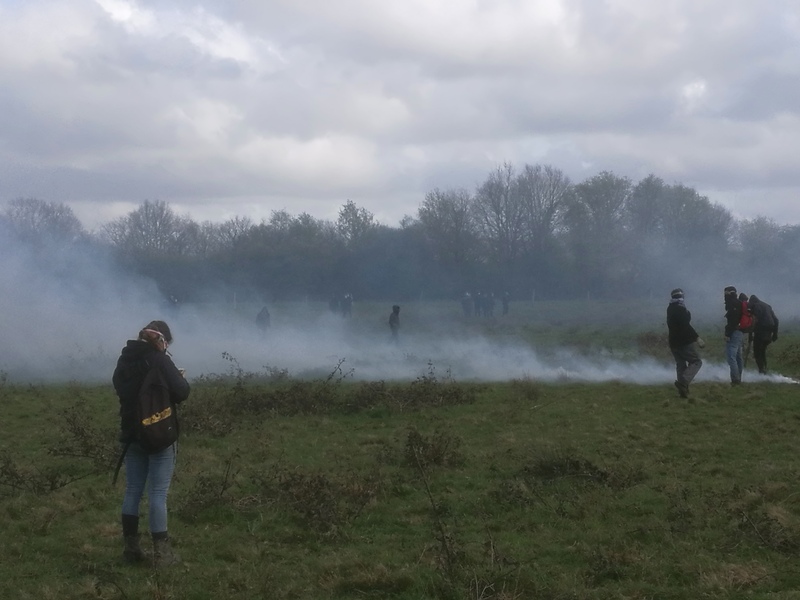 Update from this mornings events in the ZAD. Update 10:14am: Cops are advancing. We will update this article when news comes in. Click at the refresh button of your browser to see the latest version. Originally published by ZAD. Extended and edited by Enough is Enough. Image above from April 15 by Enough is Enough. 10:14am The cops are now well on the way to Suez road. They passed the Lascars barricade and l’ambazada and are almost stationary at the eastern entrance of champ de Kazh Koat and in the forest.It is not known how far the police action extends north into the forest. Machines and cops are also deployed on the route des Fosses. We know that they close the trenches in front of Youpi but no more details for the moment. 08h42min : The police vehicles (one armoured car, accompanied by a hudred horribles in riot gear), are driving down the barricades on Route des Fosses / Mancelière from the north. They are now at the level of the garden of the Grée. Apparently these people are accompanied by a sub-prefect. Never believe what the cops tell you : they said they would not come in if we did not attack them. Which, on the part of people who arrive with an armored and 100 super armed horribles, is pretty cheeky. The armoured car is now heading back to the north. Meanwhile, the cops are disking the Lascars barricade. There are about 50 of them on the road, and we also find a good pack of these turds splattered around the forest of Rohanne. No more precise indication of their position at the moment.